Aini (third left) and Harry (third right) after exchanging MoU documents, witnessed by Idris (fourth left). — Photo by Muhd Rais Sanusi. KUCHING: The Ministry of Higher Education Ministry has allocated a RM1 million fund to kickstart ‘Sarawak Pepper Farm’ project on a 25-acre land at University Putra Malaysia (UPM) Bintulu Campus to be developed in phases, beginning this month. The setting up of the Sarawak Pepper Farm @ UPM Bintulu is the result of a strategic research collaboration between UPM, Ministry of Education, Science and Technological Research and Malaysia Pepper Board (MPB). UPM Vice-Chancellor Prof Datin Paduka Dr Aini Inderis said this project is a comprehensive partnership to drive up pepper production in Sarawak in particular and Malaysia in general. 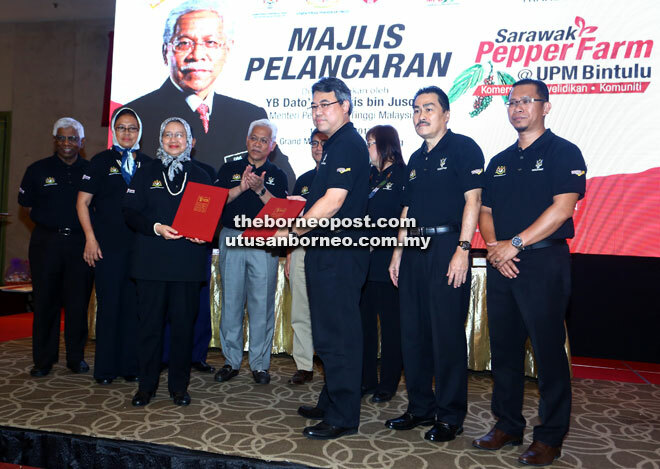 Aini highlighted this at ‘The Translational Research: Sarawak Pepper Research Project and Development of Research Farm and Community’ at UPM Bintulu Campus launched by Minister of Higher Education Datuk Seri Idris Jusoh at a leading hotel here yesterday. Hence, the pepper research farm hopes to explore several main issues in the industry such as less productive pepper tree, use of costly wood support like belian wood, unstable market price, and low participation from the younger generation. The project will involve three main programmes: five acres for Research, 15 acres for Commercial Production, and five acre for Community Plantation. The research will focus on four areas: Pepper Planting, Pepper Production, Downstream Technology, and Humanity Dimension to be led by researchers of UPM and MPB. The pepper farmwill be developed through the best and sustainable agriculture practices expected to draw pepper farmers, entrepreneurs, scientists, investors and students. “We believe the project will ensure the sustainability of pepper plantations in Malaysia and support the national mission to increase plantation areas from 14,000 to 20,000 hectares by year 2020, making the country the main producer of pepper in the world,” she said. “I hope this effort with collective collaboration will be fruitful with results beneficial to the well being of our people,” she concluded. The programme was attended by some 400 farmers from around Kuching, Bau, Serian and Lundu. It also witnessed the signing of Memorandum of Understanding (MoU) between UPM and MPB as well as presentation of research grant, Excellent Student Award and UPM Excellent Research Scheme (SKP UPM). Assistant Minister of Education and Technological Research Dr Annuar Rapaee, Deputy Minister of Higher Education Dato Mary Yap, Higher Education director-general Ir Dr Siti Hamisah Tapsir and MPB director-general Dr Harry Entebang were among those present.